Custom Imprinted 6-Piece Crayon Sets are coming nicely packed in a Natural paper box and are featuring crayons in Black, Blue, Green, Orange, Yellow and Red colors. They have an approximate size of 2" W x 3 ½" H x ?" 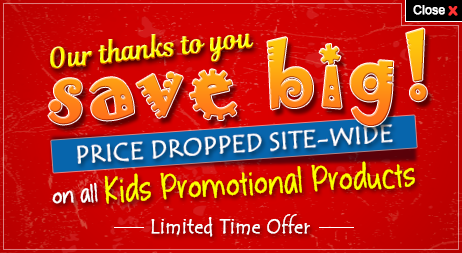 D and are excellent as kids promotional gifts for painting and drawing camps, art classes and also kindergartens. Along with the 1 ¼" W x 1 ¼" H standard imprint area in the front, there is also an optional 1 ¼" W x 2" H imprint space in the rear side of these crayon sets to give the brand best publicity. 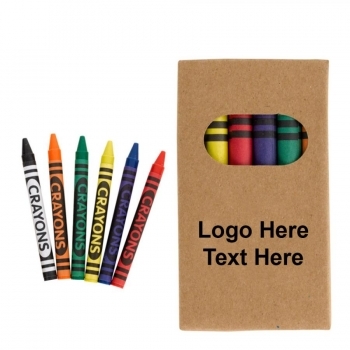 Order these custom 6 pack crayon sets today to get free design and free online proofs. Request a quote to know what you can save on ordering this Custom Imprinted 6-Piece Crayon sets in bulk.